We were so happy to see the Boba X baby carrier winning a gold Mumii award earlier this year, and now we’re getting some rave reviews from the people who matter the most: the parents and sling consultants who are using the Boba X day-in-day-out. From new mums carrying the tiniest of tinies, to experienced sling consultants recommending carriers for active toddlers, we’ve loved reading your Boba X reviews. So for those of you looking for more info about Boba’s latest baby carrier, we’ve collected together all of these Boba X reviews in one place. Take a glance at our summary below, or scroll on down to see Boba X reviews straight from the people who know best! Parents love that the Boba X can be used for newborns and preschoolers alike. There’s no need to invest in a new carrier as your child grows, and those parents with more than one child are pleased that they can use the same carrier for multiple children. The velcro waistband makes it easy to make micro-adjustments, creating a perfect fit for any size baby. It makes the carrier super versatile and easy to adjust, meaning you can quickly change between wearer or child. 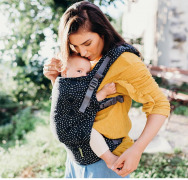 A lot of the feedback praises the comfort of the Boba X. It’s ergonomic design, and ease of adjustment makes it comfortable for both wearer and child - lots of naps being had in the Boba X from what we hear! Mums have told us that the Boba X is easy to breastfeed discreetly in - not something that can be said of every buckle carrier! What did the sling consultants say? "Running a very busy sling library across the second largest county in the U.K. we see a lot of parents every week and we regularly hear the same requests. Families with children close in age want one carrier that will suit their family. Dad, mum, newborn and toddler can all enjoy using the same carrier … in the past we would have to tactfully say that it wasn’t possible but with the Boba X, it really is! The Boba X can quickly and simply be converted from a very small newborn setting to a large toddler setting, taking seconds to convert. Without compromise of comfort or safety. Toddlers and tiny babies feel fully supported and we’ve just seen so many parents beam with delight over discovering the Boba X carrier! I particularly like the fact that the adjustable waistband is Velcro, meaning you don’t have to wonder whether your baby needs to move up to the next “setting” you can just make micro adjustments, creating a truly perfect fit. Recently I carried my 3 and a half year old in the Boba X on my front and she was so comfortable and happily fell asleep! I’ve also carried a friend’s newborn baby in the exact same carrier and had the exact same result - it really is amazing!" We LOVE the Boba X. In fact, it’s been out on hire solidly since we got it! The adjustable panel means it truly fits from birth (ish) to toddler, and the crossable straps make it more versatile than older Boba models, and able to fit a greater range of body types. We’ll be looking to order another one very soon! I really like the new Boba X. The hood rolled up is great as neck support, and very clever. The PROPER dual adjust straps continue to make me happy. The fact that it fits a small baby and a huge toddler without compromising anything is brilliant. The Boba X is a great carrier that really does work from newborn through to Pre-Schooler. Parents like how easy it is to use (especially with the straps done up rucksack style) and how adjustable it is as baby grows up. The lovely new patterns and colours are an added bonus! "Comfortable for wearer and two year old in both front and back carry, great for tired toddlers. Very easily adjustable, handy pocket and bag holders, versatile carrier which is great value for money as can be used for multiple children for many years." "I was not disappointed. It feels like a perfect mix between a carrier and a wrap, and gives me that extra security now that my little one is on the heavier side at 8 months old. Overall, it was incredibly easy to adjust with or without baby inside the Boba X. It is honestly the most secure and comfortable carrier I have worn, for both me and baby. It truly does grow with your little one." Want to get your hands on the Boba X? If you’d like to find out more about the Boba X and whether it’s the right carrier for you, head down to your local sling library, or get in touch with us at Slumber-Roo. We know there is no ‘one-size-fits-all’ solution when it comes to baby carrying and our friendly team loves to help parents find the right carrier for their family.